Lake Michigan is known for record class game fish like Chinook Salmon, Coho Salmon, Steelhead, (Rainbow trout) Brown Trout, Lake Trout, and many warmer water fish species; perch, walleye. Many captains fish year-round on Michigan's world class tributaries. Always remember to look for the MCBA logo when taking your next Fishing Charter trip. 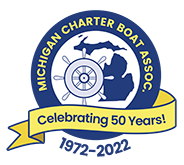 The Michigan Charter Boat Association represents over 600 professional captains that serve over 100 ports in Michigan. As one of Michigan's largest recreational organizations, member captains operate fishing charters on the Great Lakes, River Guides on Michigan's thousands of miles of steams and rivers, out of many Michigan ports of call, Scuba Dive Charters in Michigan's shipwreck dive preserves, and scenic cruises exploring the beauty of Michigan's 1000s of miles of shoreline, lighthouses, or a lake vacation adventure. These businesses contribute to Michigan's tourism economy and are vital to the region. Michigan Charter Boat Association Captains and their vessels meet all state and federal laws.